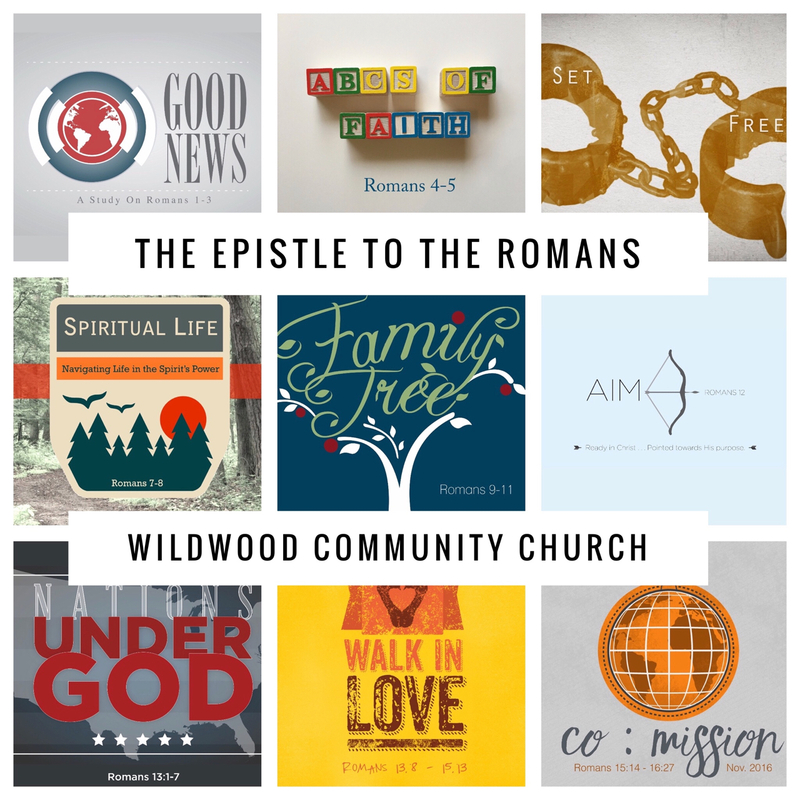 Over the past 16 months, we have preached through the book of Romans at Wildwood Community Church. The 43 sermons walked us verse by verse through Romans 1:1 – 16:27. We arranged our study in 9 different series, represented in the graphic above. It is our hope that these 9 divisions will help you remember the truth God has given us inside Paul’s masterful Epistle. Let us thank God together for the power of the Gospel — the Good News of Jesus Christ! On Sunday, November 27 at Wildwood Community Church, I preached a sermon based on Romans 16:25-27. This message was part 4 in the “Co:Mission” series. Below you will find the sermon audio to listen to or share. On Sunday, November 27, 2016 at Wildwood Community Church, I preached a sermon based on Romans 16:25-27. This message was part 4 of the “Co:Mission” sermon series. Below are a series of questions related to the message for personal reflection or group discussion. Paul describes God (in 16:25a) as the “One who is able to strengthen” us. What is going on in your life right now where you sense the need for God’s “strengthening”? 16:25-26 tell us that we are strengthened by the Gospel and by preaching about Jesus Christ. How does the Gospel and preaching about Jesus strengthen you in your daily life? There is a trend in advertising . . . especially demonstrated during TV infomercials . . . where a product is promoted with the tagline: “But wait — there’s MORE!” You know the drill. Not only does the Sham Wow dry your car after washing it, but it also makes great Julienne Fries! Does anyone actually buy these products? And if they do, can these products ever really deliver on their promise of MORE? I want to contrast products now with people. While most of my life I have been disappointed with the diminishing returns of products, I have equally been encouraged with the increasing fruits found in relationships with people. Take my wife for example. We have been married for over 20 years. We have been friends for 30 years. In that time, I can honestly say that I am blown away by how I continue to know her MORE, and love her MORE. While infomercials promise MORE and deliver less, relationships (like a marriage) can actually provide increasing returns when a husband and wife continue to lean in and love each other. Now for some who hear this claim for MORE, they will roll their eyes in disbelief. Years of products that have over promised and under delivered have taught us to be skeptical of such claims. But here is the deal. The Gospel is not a product. It is tied to a Person, Jesus Christ, who is always leaning in, always loving, always pursuing us – even while we are still sinners. Paul ends his letter calling us to praise God for the provision of the full Gospel. Sunday at Wildwood, we will look at this conclusion in Romans 16:25-27 as we wrap up our “Co:Mission” series in our 8:30, 9:45, and 11:00 worship services. We will also be celebrating the Lord’s Supper together as we conclude our study through the book of Romans. See you there! On Sunday, November 20, 2016 at Wildwood Community Church, I preached a sermon based on Romans 16:17-20. This message was part 3 in the “Co:Mission” sermon series. Below is the audio of this message to listen to or share. On November 20, 2016 at Wildwood Community Church, I preached a message based on Romans 16:17-20. This message was part 3 in the “Co:Mission” series. Below are a set of questions related to the message for personal reflection or group discussion. Why do you think it matters for the teaching in churches to be truthful? What are some examples of false teaching that you have been exposed to INSIDE a church (or from Christians)? In today’s message, a three-fold “test for the teachers” was mentioned. 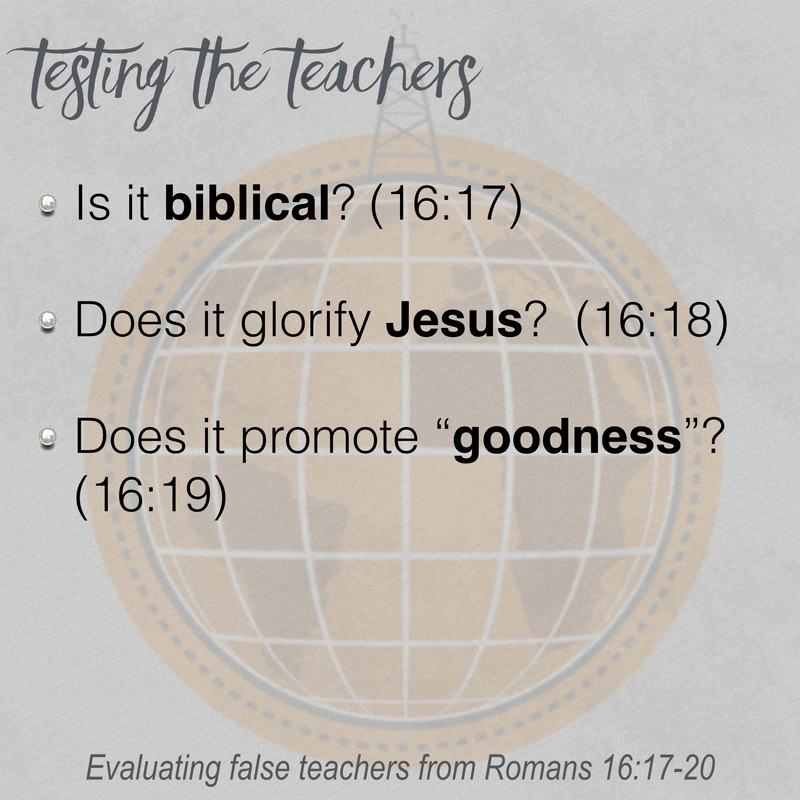 According to Romans 16:17-20 we are to examine if something is biblical (16:17), Jesus glorifying (16:18), and promoting goodness (16:19). Think of the examples of false teaching you identified in question 4 above. How did that false teaching “fail” the tests Paul lays out in today’s passage? A few years ago, Kimberly and I went to visit her sister’s family in Texas. One afternoon while we were there, I helped my Father-in-Law (also was visiting at the time) and my brother-in-law fix their kitchen faucet. While their faucet worked just fine (when you pulled up on the handle, water poured out), it was plumbed backwards . . . hot and cold water were reversed, so that you turned the handle left to get cold water and right to get hot (just the opposite of sinks in America today.) Being a rookie home owner (and a non-parent) at the time, I did not understand what the big deal was. The sink “worked” after all. Why should we go monkey around with it just to right the cold water line? I was thinking about this story this week as we prepare for our study of Romans 16:17-20 this Sunday at Wildwood Community Church (in part 3 of our Co:Mission series.) In these verses, the Apostle Paul shares a strong rebuke concerning false teachers inside the church. We are to have nothing to do with them . . . to be on the lookout for them . . . and to avoid them. Why was Paul so strong about false teaching? After all, what if people like listening to certain teachers? Why “fix” teaching if it appears to be “working”? Paul’s response seems to be similar to my Father-in-law’s. Join us this Sunday in our 8:30, 9:45, or 11:00 worship service as we explore this topic more deeply together. We will also be looking back at the baptisms from this past Sunday in a video montage and praising God together for who He is. We look forward to seeing you on Sunday, November 20. We have much to be thankful for! On Sunday, November 13, 2016 at Wildwood Community Church, I preached a sermon based on Romans 15:22-16:16. This message was part 2 in the “Co:Mission” sermon series. Below you will find the audio from the sermon to listen to or share with others. On Sunday, November 13, 2016 at Wildwood Community Church, I preached a sermon based on Romans 15:22 – 16:16. This message was part 2 in the “Co:Mission” series. Below are a set of questions related to the message for personal reflection or group discussion. 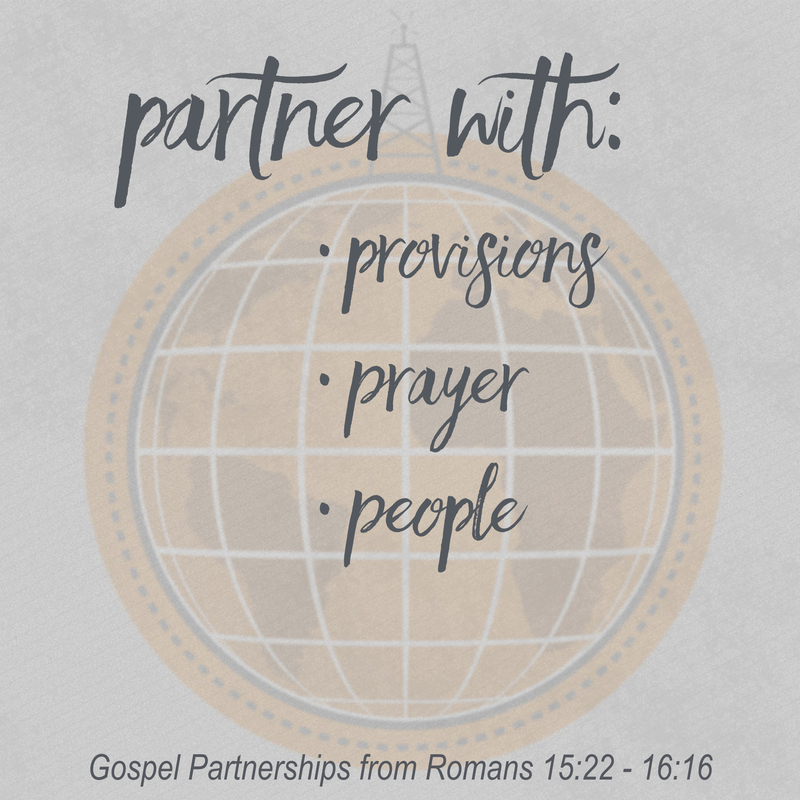 What are ways you can partner with your provisions in reaching the world for Christ How are you investing what God has given you materially in the Great Commission? What are are ways you can partner with your prayers in reaching the world for Christ? How are you striving in your prayer life for the safety and effectiveness of missionaries around the world? What are ways you can partner with other people in reaching the world for Christ? Who has God connected you with who is sharing Christ in another culture? Today is Veteran’s Day. On this day around the country people cheer the contributions America’s soldiers have given to protect our freedom. With Veteran’s Day this year falling just a few days after a very contentious national election, it is particularly refreshing to see people in all states (Red and Blue) stand at attention in honor of those who have represented us in battle. America’s partnership with our military is a cord of at least three strands. One strand recognizes the importance of the task to which our soldiers have committed their lives. A second strand involves the financial partnership American’s have with our military . . . our taxes fund our defense. Because we value our freedom, we invest in preserving it. A third strand involves our hearts. Knowing that our service members are someone’s husband, wife, son, or daughter (and many times our own), our hearts are tied to their sacrifice. We pray for their safety and wrap ribbons on trees upon their deployment. I was thinking about that today as I reflected further on Romans 15:22-16:17. In this section, Paul is encouraging the Christians in Rome (and by way of application, us as well) to wrap tightly around the apostolic mission that extended far beyond the natural “reach” of their church. In these verses, Paul describes ministry that would span 3,000 miles in nautical voyages to fulfill. He talks about ministry as far east as Jerusalem and as far west as Spain. While these two locales appear on the same side of our globe, they represented the edges of Paul’s world. As we saw in Romans 15:14-21, Paul felt compelled by God to preach the Gospel to those who had not yet heard . . . and he wanted to offer a three stranded cord to tie the Romans hearts with his in the fellowship of this great co:mission. Remembering the importance of the Gospel is the first strand. Knowing that we have been set free from sin’s necessary rule by the work of Christ is liberating for us, and a reminder that we must offer this freedom to others as well. Investing financially in ministry that we might never see is a second strand. Paul was collecting money to support hungry Christians in Jerusalem and to fund missionary expansion in Spain. Both gifts were needed and wound around the missional partnerships Paul was forming. Bowing our hearts in prayer for the success of missions is the third strand. Paul requested real partnership in his ministry by praying for safety and success. Though Paul had not yet visited Rome, he was bold in asking for this braided response and he was hoping the Roman Church would stand up and salute (as had the churches of Greece before them). 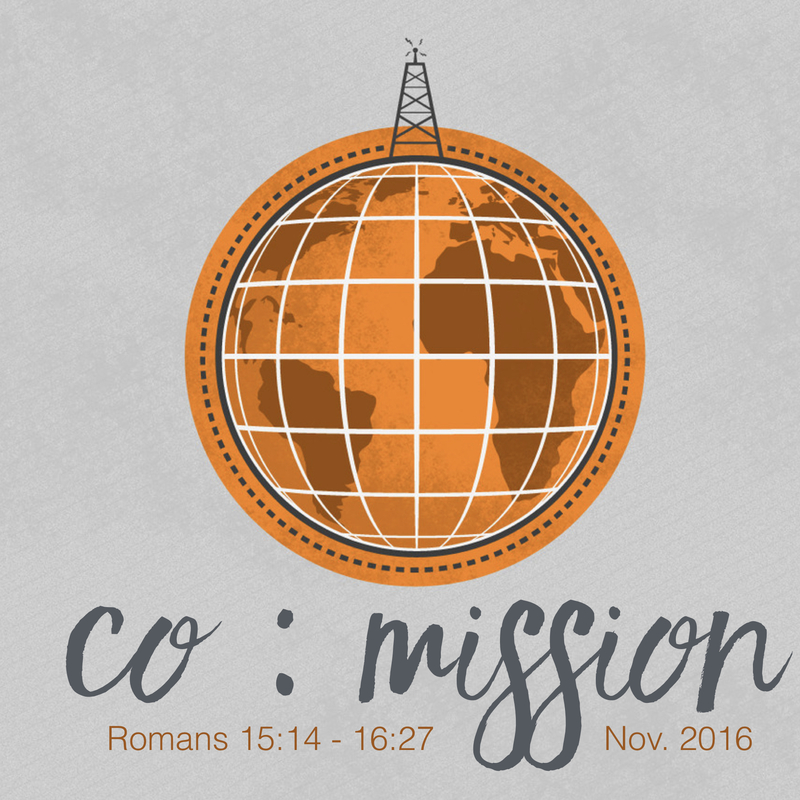 This Sunday at Wildwood Community Church, we will be gathering to worship Jesus together and look at Romans 15:22-16:17 together in part 2 of our “Co:Mission” sermon series. We hope you will make plans to join us as we wrap our minds around the cords of Christ’s truth together. Hope to see you in our 8:30, 9:45, or 11:00 worship services! P.S. In our 9:45 and 11:00 services we will have 8 families dedicating babies. It should be a great time of celebration! P.S.S. Also, remember to join us back on Sunday night, November 13 at 5:30 in the Worship Center at Wildwood as we celebrate the baptisms of 21 people who have trusted in Christ. I can’t wait for Sunday!